Killam Enjoy the sites of unique scarecrows during their Scarecrow Festival in October. The Killam Agriplex boasts an indoor swimming pool, artificial ice arena, bowling alley, fitness room, multipurpose room and concession. OUTDOORS Be sure to check out Centennial Park for both winter and summer activities. Enjoy the playground or the sports grounds with four ball diamonds. Fully serviced spots at the Park’s campground make extending your stay easy. Heritage Park offers a gazebo, nature trail, playground, horseshoe pits, along with a bike and a skateboard park for residents and visitors to enjoy. You’ll love the paved 2.5 km trail for walks or biking through town. EAT SHOP STAY Find the perfect gift, or treat yourself at Budding Ideas Flowers & Gifts, serving the community for over 25 years. Make time to browse through the huge Town & Country Guardian Drugs store which carries an amazing amount of merchandise. Enjoy a delicious hearty meal at Jam Tarts Café. Plan to stay at the Killam Krossing Hotel – with a Smitty's Restaurant conveniently located on site – or at the cozy Wagon Wheel Motel. 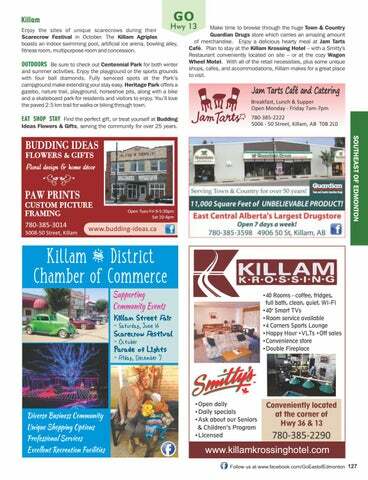 With all of the retail necessities, plus some unique shops, cafes, and accommodations, Killam makes for a great place to visit.